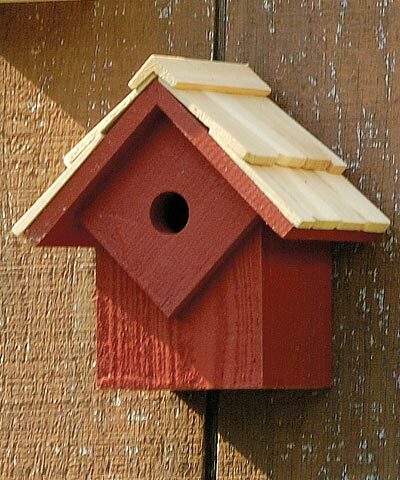 Whether you're a bird house expert or new to the avian world, the Heartwood Summer Home Bird House makes a quaint addition to your lawn or garden area. The entire home is constructed of cypress, while the roof features hand-cut and stone-washed shingles. Rich redwood paint covers the exterior, but the cypress shingles are left in their natural tone. A predator guard surrounds the 1" diameter entrance hole, providing extra reinforcement for the nesting birds inside. At the back of the house, a copper covered door allows for easy seasonal cleaning. Use the included metal hook to conveniently place the Summer Home on a wall or post, wherever your songbirds will like it best. Made in the USA.